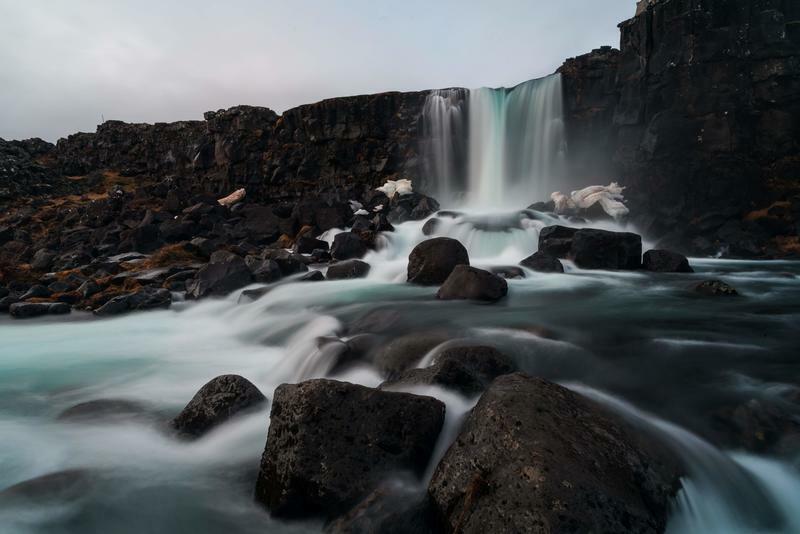 Editor's note: Outdoor Project contributor Jason Leach was awarded the winner of Outdoor Project's 7-Day Iceland giveaway in April 2018. This story details part of his trip. Iceland has two main seasons: high (summer to fall) and low (winter to early spring). Summer months in Iceland can see no darkness at all. 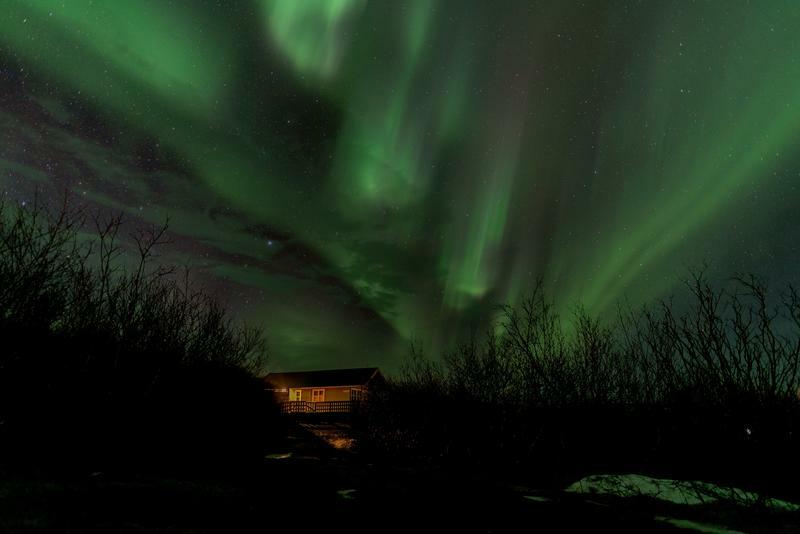 So if your goal was like ours—to see the Northern Lights in Iceland—then you’ll need to aim for the low season. With a bit of planning and a dash of luck, you just might be treated to a show! An internet connection to check the aurora forecast. The Iceland Meteorological Aurora Forecast is your best friend for planning out your viewing spot. 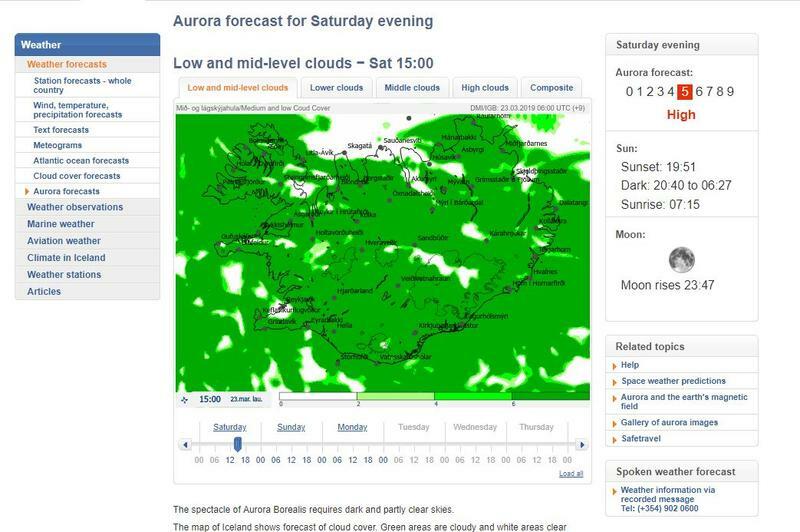 The forecast website shows you a prediction of cloud cover and the strength of the aurora for the next 3 days and assigns an "aurora forecast number" on a scale of one to 10. Anything five or above means you have a good chance of seeing the aurora if you can find clear skies. A flexible travel schedule. Fortunately, finding darkness in Iceland during the low season is as easy as driving away from Reykjavik. But you don't always know which direction to go. Flexibility gives you the freedom to chart a course on the spot. The aurora forecast indicates clear skies in white. Cloud cover is indicated in green. Jason Leach. It was recommended that we check the forecast daily since, like a weather forecast, conditions change by the hour. Unfortunately for us, the first three days of our trip showed the aurora forecast at a one with large amounts of cloud cover. Thankfully, there are plenty of other sights to see in Iceland. Another advantage to traveling during the low season: fewer crowds, less traffic, and cheaper prices. The biggest drawback is the unpredictable weather. We made our way to the Skaftafell on the south coast to check out Jokulsarlon (Glacial Lagoon) and Diamond Beach. On the drive, we made stops at some of the popular tourist sites: Seljalandsfoss, Skogafoss, and Vik. We even spent part of a day exploring Skaftafellsjökull, all the while with an eye on the aurora forecast, which unfortunately continued to show rain and clouds. 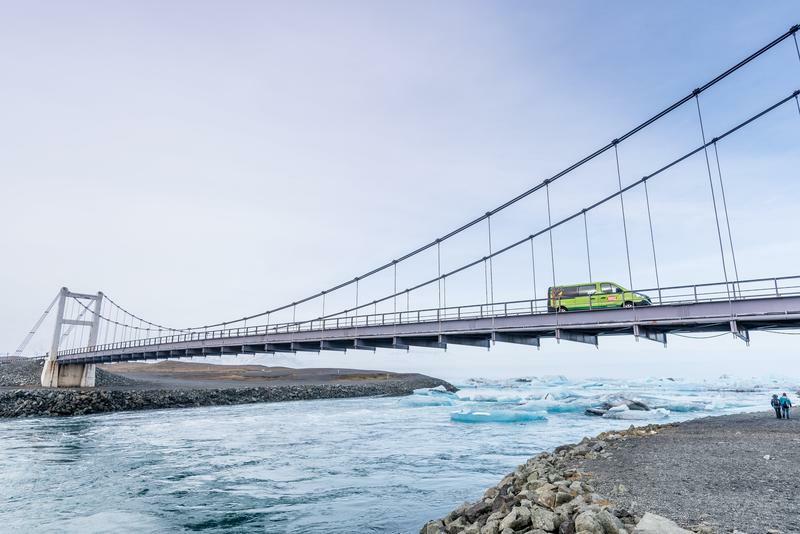 Traveling over the bridge to Jokulsarlon and Diamond Beach. Jason Leach. We learned a few things exploring Iceland in the low season. Our first lesson: Coming from sunny Colorado, our rain gear needed a refresh on its waterproofing. I highly recommend you apply some DWR before your trip. Winter in Iceland is actually warmer than winter in New York. The temperature in the low season lingers right around 32 degrees most of the time. (A puffy jacket should work most of the time.) The biggest weather challenge was the wind. The daily average wind speed was 11 miles per hour, and one day we had 75-mile-per-hour gusts stranding us at our campsite. When weather moved in, it quickly moved back out again. If you were willing to brave it, you could find times when crowds would thin out at the more popular sites, particularly when the rain started. Bummed about our gear and the weather, we did hit a stroke of luck and stumbled into the best fish fry we’ve ever had! If you happen to visit Jokulsarlon, you’ll find a tiny stand in the parking lot, where the owner only sells three things: fish and chips, beer, and soda. It was worth every krona we paid on that dreary day! A waterfall in Thingvellir National Park. Jason Leach. Toward the middle of our trip, we traveled toward the west coast, stopped at the black sand beaches of Vik, and headed inland toward Uthlid, Thingvellir National Park, Geysir, and Gulfoss along the way. We saw our only sunrise at Gulfoss. In the low season, the sun rises and sets around 9 a.m. and 6 p.m. While we were awake for both sunrise and sunset everyday, the morning at Gulfoss was the only one with just the right amount of clouds to put on a show for us. Another check of the aurora forecast, and we saw that it had jumped to a 5 for that very night with clear skies predicted around midnight! Even better, it was all supposed to take place directly above our previous night's campsite at Uthlid. Not needing to be anywhere specific the following day, we took a chance and booked another night, charged our camera batteries and set an alarm for midnight. 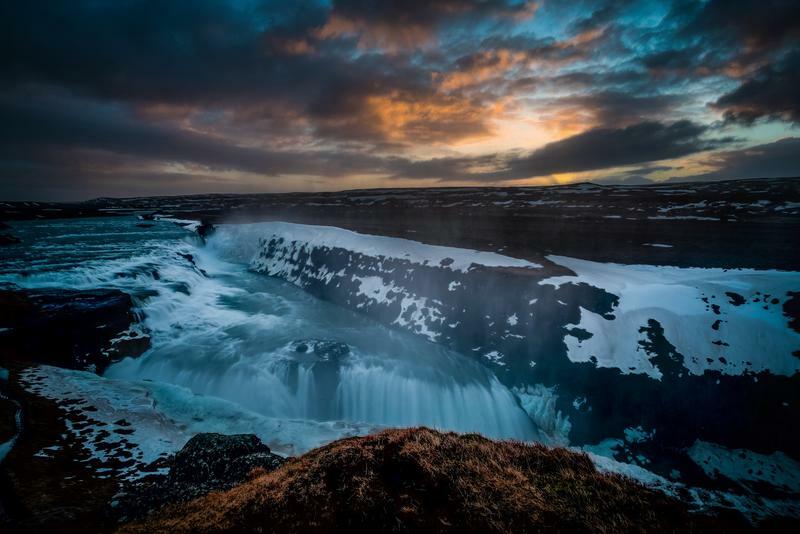 Gulfoss at sunrise. Jason Leach. The alarm went off, I jumped out of my sleeping bag, grabbed my camera, and stepped outside. Nothing. I took a few 10-second test shots with my camera. The northern lights were there but hiding above the clouds. Disheartened, I returned to share the news. With the next few days forecasting even more clouds and a lower aurora forecast, tonight was our best shot, and the weather had struck again. On an off chance, my travel companion Rachel thought to check that night’s forecast again, just in case. As luck would have it the forecast had changed while we were sleeping and clear skies were now predicted at 1 a.m.! Another alarm was set—but neither of us slept. The northern lights dance over Iceland. Jason Leach. Blurry test photo confirmed: We were standing under the northern lights! We moved away from the outdoor lightning and walked farther into the dark. Our eyes adjusted, and the aurora became brighter, more colorful, and more distinct. We spent the next hour watching them dance across the night sky. No photo I took does them justice. The silence, the motion, and the experience left us in awe for the rest of the trip. We had front row tickets for one night only thanks to a flexible travel schedule, an internet connection, and a bit of luck with the weather!